General View of Meigle no.2, an upright cross slab. 8'1'' high by 3'3'' wide, and 6'' thick. 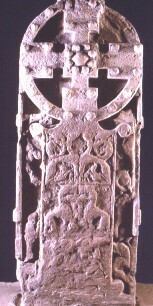 This shows the front of Meigle no.2, an upright cross slab. The cross is in the middle and extends for the full length of the slab. The head is ornamented with a raised boss surrounded by eight smaller bosses. There are four smaller bosses on each arm, and two on each quadrant of the ring connecting the arms. On the shaft there are three pairs of beasts facing each other, one above the other. The details, particularly on the lowest one, are hard to make out. On the left of the shaft there are three figures (?). On the right of the shaft there are three beasts with convoluted bodies, one above the other. Stuart, J., The Sculptured Stones of Scotland 1st, Spalding Club, Aberdeen and Edinburgh (1856-1867) Sculpture, Scotland, History, Archaeology.